My final Mellow Bakers bread for August is black bread. This is a sourdough rye made with an old bread soaker (rebaked mixed-flour miche mixed with hot water, coffee grounds, and vegetable oil), rye flour, high gluten flour, salt, instant yeast, and sourdough. The dough was fairly crumbly (there's no water added other than the water in the soaker and the sourdough), and my mixer couldn't seem to bring it together. However, after a few minutes of kneading by hand, it formed a workable dough and I was able to proceed. The bread has a relatively short bulk and final fermentations. We tried the bread with a little butter. It had a really interesting, complex flavor, and we could definitely taste the coffee. We gave the rest of the loaf to my dad, the designated sourdough rye-eater. September? What? But I haven't finished August's Mellow Bakers breads yet! Too true. But my last August bread (black bread) calls for using an old bread soaker, and unfortunately I haven't baked bread in soooooo unbelievably long (with the exception of hamburger and hot dog buns) that I don't have anything to use. So I decided to make a September bread that would fit the bill and maybe have a couple of pieces left over for the old bread soaker. When I pulled Austin (my sourdough starter) from the fridge, I really couldn't remember the last time I'd fed him. He was gray and hoochy, and smelled very chemically. I refreshed him twice a day, and while he smelt better by the end of the first day, I decided to give him a few extra days to really get back in gear (continuing to refresh twice a day). I think it worked, as this bread rose more than any other pure-sourdough I've ever made. Wahoo! The levain is made the night before with Austin, water, rye flour, and whole wheat flour. After a twelve hour rise, it's combined with more whole wheat flour and rye flour, bread flour, water, and salt. I let it proof for two hours with three folds, and then shaped it into a round. Without bothering to set a timer, I left it on the counter...pure sourdoughs (without any additional pinches of instant yeast) always seem to take longer...and was shocked to discover that it was rising really well! The only downside was that when I went to put it into the oven, I realized that I'd prepped for pizza baking instead of hearth baking (pizza stone on the floor of the oven and no steam pan), so I had to do some quick adjusting of oven shelves with my welding gloves on, while yelling at the kids to stay away from the open oven, and then use the fake-steaming method, and my slashing suffered severely as a result of my frantic-ness. We waited about eighteen hours before slicing into this bread, and this is definitely one of the tastiest breads I can remember from the levain section. While you can taste the sour, it isn't too sour; the flavor of the whole grains is clearly there, without the dense rye-ness of the sourdough rye breads. Yep, this one is a keeper! So August is officially our Bake! catch-up month, but knowing how crazily busy September will be with school starting up again, I decided to bake ahead a bit.......I needed a dessert to bring to a family cabin barbecue this weekend, so I let hubby pick from upcoming Bake! recipes. He choose the one for the first week of September which was picked by the newest member of our little group, Glennis: truffle brownies. We've already baked the Florida brownies, which were to-die-for, and I have to say that the truffle brownies are just as dangerous. Because we were going to the family barbecue, I made a full recipe (a 9x13 pan); unfortunately, the little girl got sick and we ended up spending the weekend hanging out at home. Hubby and I did quite a bit of damage to the pan. Luckily the girl was better by today and we were able to do an abbreviated trip to the cabin...saving ourselves from eating the entire pan....which we could've easily done. At home, I served the brownies with Jeni's vanilla bean ice cream (via Food and Wine), which hubby declared the best vanilla ice cream he'd ever eaten. He was such a fan, in fact, that I've finally broken down and ordered her book. For my dad's birthday dinner on Thursday, I'd made two puff pastry layers. But because my hubby and baby girl don't like raspberries, I decided to turn one of the layers into chocolate-filled Napoleons, another puff pastry recipe for the Modern Baker Challenge. NM's instructions indicate forming these into rectangles or squares, but my puff pastry layer wasn't big enough for two of my 8x8 pans, so I decided to go with circles and cut out two 6" rounds. The mousse is made with heavy cream whipped with Grand Marnier, a meringue made with egg whites, sugar, unflavored gelatin, and cold water, and finally some melted bittersweet chocolate (I used 60%). Check out Margaret's beautiful Napoleons! Several months ago, one of our Bake! recipes called for puff pastry. Rather than purchasing some, I tackled my fears and made the recipe in Bake! I found this video invaluable; Nick Malgieri makes the puff pastry process look effortless. And now, here we are in the puff pastry section of The Modern Baker Challenge. I began by following the recipe in The Modern Baker. As in his other recipe, NM focuses on a faster and easier method for making puff pastry, eliminating the 5,000,000 folds and turns and rests in traditional puff pastry. This recipe is slightly different from the one in Bake! You start by combining flour and salt in a food processor. Then you add chunks of butter and pulse just a very few times. Finally you add a bit of water, pulse a few more times, and dump it all out onto your counter. For some reason, I had a more difficult time getting this dough to come together; I think the one in Bake! was slightly easier for me, but this one did finally work. I rolled and turned the dough, and then folded it. I cut it into four pieces (about 325 g each), stuck three into the freezer, and turned the smallest one into elephant ears...yum! A few days ago, I moved two batches of dough into the fridge to defrost. And now a new challenge: baked puff pastry layer. When defrosted, I pulled the dough out of the fridge and began to press on the dough until it was soft enough to roll, turning 90 degrees after each press or roll. When I had each piece into a 12 x 15" square, I placed them on jelly roll pans lined with parchment paper and stuck them in the fridge. When it was time to bake, I removed a pan from the fridge, pierced the dough with a fork, and covered it with another piece of parchment paper and another jelly roll pan. My layers were perfectly done in 25 minutes (15 minutes on the first side, 10 minutes on the second). Check out Phyl's detailed post on how to bake the puff pastry layers. And now it's time for my official post for the puff pastry section: raspberry mille-feuille. Raspberries are one of my favorite fruits, but because hubby doesn't like them, I rarely bake the raspberry recipes. However, it's my dad's birthday, and he loves raspberries, so I thought this seemed like the perfect birthday dessert for him! Knowing that hubby and the little girl don't like raspberries, I decided to make a half recipe of the raspberry mille-feuille and a half recipe of the molded chocolate-filled Napoleons (post tomorrow). So I took one of the baked puff pastry layers and, using a parchment paper template of my 6" cake pan, cut out two circles and two semi-circles. I made a half recipe of the pastry cream, using milk, sugar, cornstarch, egg yolks, unsalted butter, and vanilla. It rested in the fridge overnight. I whipped heavy cream with sugar and kirsch, and then combined a bit of it with the pastry cream. Even after the overnight rest and the addition of the whipped cream, my pastry cream was really liquidy. I'm sure I did something wrong; the pastry cream for the Parisian fruit tart worked perfectly last year. Assembly was easy: layer of puff pastry, pastry cream, raspberries, whipped cream, puff pastry, pastry cream, raspberries, whipped cream, puff pastry. And a dusting of confectioners' sugar before serving. This was a huge hit, with the birthday boy, my little guy, and even my raspberry-hating husband! As I've been mentioning, we've been getting a ton of zucchini and summer squash in our CSA boxes. I've been looking for creative ways to use it, and read in several places about people who used planks of zucchini in place of noodles in their lasagna. I was intrigued. My first try was okay, but not great: way too much cheese, not enough meat, although it was clear that zucchini really did make an acceptable substitute for noodles in lasagna. Tonight, I offered to make dinner for my dad's birthday at the ballpark; knowing pasta isn't good for him, I decided to give the no-noodle lasagna another try...and this time, it was perfect! My stepmom was the only one who said she could tell it was missing noodles, and my dad, who is my most honest critic, said it was really good! Even the kiddos, who didn't like the first version I made, ate theirs. There are a lot of steps, but that's true of regular lasagna, too. This version is healthier, tasty, and uses up that plethora of zucchini and summer squash! *If you prefer, leave out the red pepper and use an extra 3 planks of zucchini or summer squash in its place. 2. Heat the olive oil in a large skillet over medium heat. 3. Add the onion and salt and cook for about 4 minutes, until the onion is starting to get tender. 4. Add the garlic and saute for 30 seconds, until fragrant. 5. Add the ground turkey and cook for about 5 minutes or until no longer pink. 6. Add the crushed tomatoes, red pepper flakes, and oregano. Turn down heat and simmer for 15 - 20 minutes, until thickened, stirring occasionally. 5. While sauce is cooking, coat a large jelly roll pan with cooking spray or brush with olive oil. Put the zucchini, summer squash, and red pepper planks in a layer on the pan. Coat with cooking spray. Cook for 15 minutes, flip, and cook an additional 10 minutes or until vegetables are tender but not falling apart. 7. While the sauce is simmering and the veggies are roasting, make the cheese blend: in a small bowl, combine ricotta, 1/8 cup grated Parmesan, 1/4 teaspoon salt, 1/4 teaspoon pepper, and chopped basil. 8. Spread 1/4 cup sauce evenly on the bottom of an 8x8 baking dish. 9. Place 3 squash planks on top of the sauce. 10. Spread 2 tablespoons of the ricotta cheese mixture on each of the squash planks. 11. Sprinkle 1/3 cup of mozzarella on top. 12. Pour 1 cup sauce on top and spread evenly. 14. Repeat ricotta layer (you may not use all of the cheese), mozzarella layer, and sauce layer. 15. Lay final 3 pieces of squash on top, again maintaining the columns. Pour the final 1 cup of sauce over the top and spread evenly. Sprinkle on the rest of the mozzarella. Dust with 1 tablespoon Parmesan. 16. Cover lasagna with foil coated with cooking spray. 17. At this point, you can either bake the lasagna or stick it in the fridge overnight. When ready to bake, bake in a 350º oven for 30 minutes, covered. Then remove the foil and bake for 15 minutes uncovered. As I've mentioned in some recent posts, we joined a CSA for the first time this year. It's always fun to see what goodies are in our box, and the boxes have been getting heavier and heavier each week. Last week, there was a cabbage. I was brainstorming recipes for our various vegetables and listing off some cabbage-related recipes, when suddenly hubby said, "Hey, what about bierocks? Would you make me some of them?!" Um, what? I'd never heard of bierocks before. When I searched for recipes, most were from Kansas, which explains why hubby grew up on them and I've never heard of them. Hubby said that back in Kansas, they were often sold at school fundraisers; apparently they're very good frozen. When I asked Kayte about it, she said that German ladies in the town next to where she grew up used to make them; she said they were really popular with farmers, a quick grab-and-go meal. The recipes all seemed fairly similar and fairly simple: cook beef with shredded cabbage and onion, season with salt and pepper, place in bread dough (or refrigerated crescent rolls), and bake. Hubby was in seventh heaven at dinner last night; he said they were just as he remembered, but with better bread; he ate his with ketchup. The baby girl liked hers plain; the little guy preferred his with mustard (how he eats hamburgers these days, too). I thought they were pretty plain, but they still made a nice, easy meal. The ultimate comfort food. 1. Warm the milk. Whisk in the yeast until dissolved; let sit for 5 minutes. 2. Combine the flour, salt, sugar, oil, and egg in a large mixing bowl. Add the milk mixture and stir until it comes together in a shaggy, slightly sticky ball. 3. Mix with a dough hook in a stand mixer on 2 for 4 minutes (or knead by hand for 4 or 5 minutes). The dough will be soft and supple. 4. Form the dough into a ball and place in a large bowl coated with cooking spray. Refrigerate until ready to use. (Dough can rest in the fridge for 1 - 4 days.) OR Let rise until doubled, 1 - 2 hours. 5. Remove dough from the fridge and allow to come to room temperature, 1 - 2 hours. 2. Add meat and brown, about 5 minutes. 3. Add cabbage, garlic, and spices, and cook until softened, about 15 minutes. Cool slightly. 4. On a floured surface, roll the dough into a large rectangle, about 1/8" thick (I actually rolled mine in several batches because I was working on a fairly small board). 5. Cut the dough into 4" squares. 6. Place 1/4 - 1/3 cup filling in the center of each square (I put in as much as I could fit, and they still tasted bread-heavy). Fold the corners up to form a little packet and pinch closed in the middle. 7. Place filled bierocks upside down on a parchment lined sheet pan. Cover and let rise for 20 - 30 minutes. 8. Bake at 375º for 15 minutes. Even though our local CSAs are having a really rough year (weeks of over 100º weather followed by torrential, destructive storms), summer squashes and cucumbers are having a fabulous year. I've been doing my best to keep up. For the zucchini and summer squash, I've used them in egg bakes, made fritters, made a no-noodle lasagna, zucchini hash browns. There seem to be a lot of creative things to do. For the cukes, I've really struggled. We use them on our dinner salads, but that doesn't even come close to dealing with my veggie drawer full of cucumbers. So I've been making a lot of fridge pickles. These are perfectly balanced: deliciously sour from the vinegar, slightly sweet from the sugar, with a hint of spice and a nice crunch. This is our new favorite recipe. 1. 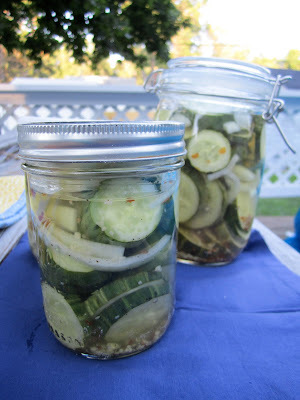 Layer sliced cucumbers and onions in jars. 2. Combine vinegars, sugar, and spices in a small saucepan. Bring to a boil and cook for 1 minute. 3. Pour over cucumbers and onions. Cool and refrigerate. 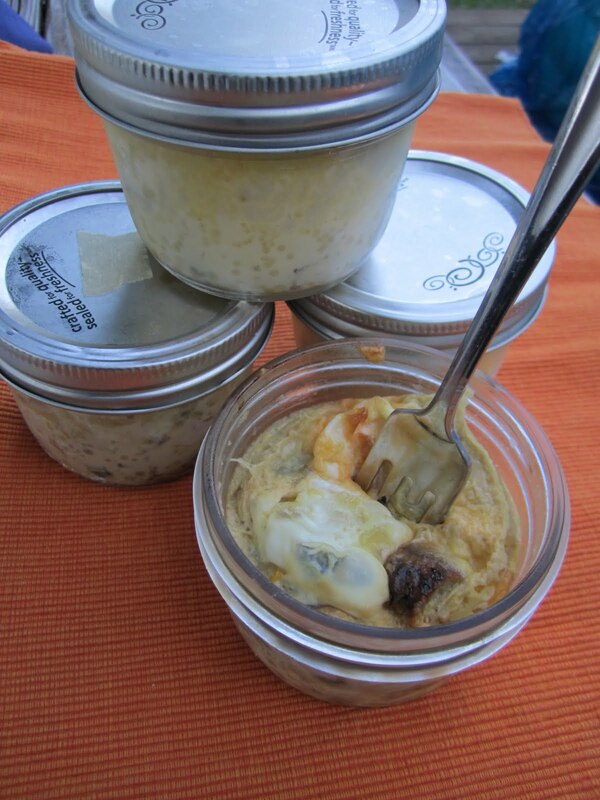 A couple of months ago, Nicole linked to this awesome breakfast idea from Food in Jars. 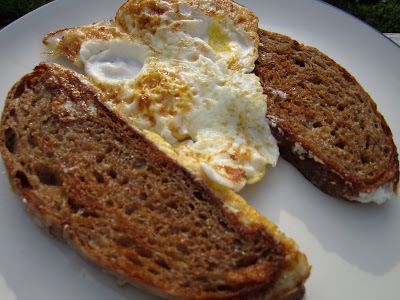 Hubby and I have been trying to start more of our days with protein rather than carb-laden breakfast cereals. But it's often challenging to spend time cooking anything more involved than pouring a bowl of cereal when we're trying to get ourselves and the little ones ready and out of the house by 6:30 a.m. So I loved the idea of making a little jar of eggs in advance, and plus they're just so cute, aren't they? At first, I was bothered by the lack of the specifics in the recipe (no specific amounts, no particular vegetables), but since then, I've experimented. I've used various meats (ham, sausage links, turkey sausage), veggies (onion, peppers, zucchini, squash, mushrooms, spinach), cheeses (cheddar, pepperjack, gruyere), all with success. I'm including specific ingredients and amounts below, just so you can get an idea. You can make these in little jars or ramekins, and I've tried both. I really love the wide-mouthed half-pint mason jars; they are a perfect serving size, after cooking you can just slap the lid on and stick them in the fridge, and the wide mouths make them easy to clean. 1. Spray a large skillet with cooking spray and cook the sausage on medium-high links until done (about 5 or 6 minutes). Remove the sausages. 2. In the same skillet, heat the olive oil. Cook the onion, pepper, squash (any of the harder veggies) for about 5 minutes, or until slightly softened and beginning to brown. 3. Add mushrooms and spinach (any veggies that don't need to cook as long) and cook for another couple minutes. 4. Slice the sausage and add to the veggie mix. 5. Divide the mixture evenly among the jars (I used about 1/3 cup veggies and meat per jar; the jars will be quite full). 6. Pour the eggs over the veggies. 7. Sprinkle about 1 tbsp of cheese over each cup and stir gently. 8. Cook in a 350º oven for 25 - 30 minutes, or until eggs have set. 9. Cool, cover, and place in fridge. In the morning, just microwave the uncovered jar for about 45 seconds and enjoy a healthy breakfast! My next Bake! rewind recipe is one that Kayte, Phyl, and Margaret made shortly after they started baking through the book: individual coconut cakes. I cut the recipe in half, and with my slightly-larger mini-muffin pan, I made nine cupcakes. My little girl helped me. First, she stirred together a bit of sugar, a tiny bit of flour, and some coconut (I used sweetened and cut the sugar a bit). Then she whisked egg whites, salt, lemon zest, and melted butter. Once combined, we filled the muffin pan, and she sprinkled a bit of coconut on the tops. The kiddos didn't like them (I think it was a texture issue), but the hubby and I both thought they were tasty little treats! The ciabatta with stiff biga recipe makes a little over three pounds of dough, perfect for the two 9" focaccias that we devoured I made yesterday plus just enough left over for focaccia con formaggio, our other Mellow Baker focaccia choice for August. The focaccia con formaggio is a less-time consuming recipe than the regular focaccia. You go straight from bulk fermentation of the ciabatta dough to dividing and forming the focaccia to the oven to eating (JH says to eat it warm). I imagine the entire process could take less than an hour, as there are no additional rise times. I, of course, had actually made the ciabatta yesterday, so I pulled the remainder of the dough out from the fridge, divided it in two (about 13 ounces each), and rolled each ball into a rectangle-ish shape. One rectangle is placed on a sheet pan covered with parchment paper; it's then spread with ricotta, olive oil, coarse salt and pepper, and toasted fennel seeds. Then the second piece is plopped on top, the edges are crimped, the top is brushed with a little more oil, some vents are cut, and the whole thing bakes on a preheated pizza stone. Because I was also cooking dinner, my focaccia con formaggio actually got some rise time while the oven was busy. I'm not sure if that's why, but mine took an additional five or so minutes before it was golden on top. This tasted much more like ciabatta than focaccia to me. Hubby and I both thought that it was really good, but that the fennel was really strong and unexpected (and I actually only used half of the specified amount because a tablespoon seemed like too much). I can see making something like this and using garlic or...some other spice inside. I served it with a salad, fruit, and a vegetable (non-noodle) lasagna ~ a recipe I'll continue to work on and hopefully perfect and post soon ~ it's a must for dealing with all of these CSA summer squash! Everyone in the family preferred last night's focaccia, and we really like the normal ciabatta recipe, too, so I'm not sure we'll make this one again...but not because it wasn't delicious! My second bread for August for the Mellow Bakers is actually two new recipes in one: our official recipe is focaccia, but it is made with the ciabatta with stiff biga from earlier in the book. When ciabatta came up last December, I chose the one made with a poolish (which we loved), so this one was new to me. Last night, I whipped up the biga (bread flour, water, and yeast) and let it rise overnight. This morning, I measured out the rest of the ingredients (more bread flour, water, salt, instant yeast)...and my scale errored right in the middle of weighing the water. Gr! I really need a scale that measures above three pounds, but it's so hard to justify getting something new when you have something that works perfectly well, you know? But I digress. So I added a few more splashes of water and I think I added a bit too much as this was a very wet dough, maybe the wettest I've ever worked with, but I just did a few extra stretch-and-folds and they worked their magic: after two hours of bulk fermentation, I had a workable (although still really sticky) dough. Then I needed to go to book club, so I stuffed it in the fridge while I was out. When I got home, I put about 400 g of dough into two 9" cake pans coated with oil. I stretched them into circles, put them on the counter to rise, and ran off to the Children's Museum. Even though I hadn't allowed them their proper rest after preshaping and they didn't fit the pans when I left, by the time I'd gotten home, they filled the pans beautifully. As for the taste? Isn't a picture worth a thousand words? Oh yeah, it was as good as it looked. We served the bread with a lovely salad (CSA greens, avocado, hard boiled egg, and pancetta with this buttermilk dressing) and a fruit salad (perfectly ripe nectarines and blueberries). Isn't it nice when a simple little supper puts a smile on everyone's face? This week's pick from Bake! is mine! :) Knowing my dad's fondness for Danish and given that this is his birthday month, I picked individual Danish apple strudels. The most challenging part of this recipe was doing the math. ;-) I didn't want to have too many sweets around, so I cut the strudel recipe in half (to make four four-inch strudels), which meant cutting the dough recipe in fourths (the strudel recipe uses 1/2 of the Christel's Danish pastry dough). I've already made the quick Danish pastry dough, which is a yeasted dough, and used it in both Danish cheese pockets and Danish apricot pinwheels. I found this recipe to be easier than the other and the dough very easy to work with. You simply combine flour, baking powder, and salt in a food processor. Cut in unsalted butter. Pulse in whole-milk ricotta and egg yolks until the whole thing forms a ball. The dough behaved exactly as it was supposed to, spent a night resting in the fridge, and was very easy to roll out this morning. Last night, I also made the strudel filling, another super easy recipe: cook down granny smith apples, sugar, and cinnamon; add some currants. Again, I let them rest overnight. The strudels took about 20 minutes to roll out and shape this morning. My dough was nowhere near as neat a rectangle as the pictures in the book, but because you flip the rolled strudel over (seam-side down), no one would ever know! They chilled in the fridge for an hour, baked for 25 minutes, and cooled for about two seconds. These were really yummy. In addition to preferring the process of making this Danish dough, I also really enjoyed the taste and texture of the finished product. As for my dad's opinion? He only got one little tiny bite because apparently apple strudels are my step mom's favorites...guess I should've made the full recipe! While reading up on our August Twitter chef, Rick Bayless, I discovered that his specialty is Mexican cuisine...and that got me thinking. Didn't my hubby receive a Mexican cookbook from his big sister shortly after we moved in together? I searched through our bookshelves and, sure enough, I found Bayless' book Mexican Kitchen in the office. When hubby received it, we did minimal cooking at our house: a few staples, but nothing adventurous. Since that time, of course, our kitchen has completely changed. Hubby absolutely loves Mexican food, so I let him browse the book and pick our first recipe; he chose smoky shredded chicken and potatoes with roasted tomatoes. Although Bayless instructs you to let things cool several times in the recipe, I was in a rush (I decided to take a late afternoon nap instead of starting dinner early), so I just let them cool for a few minutes in between steps, and it worked fine. Dinner was on the table in less than an hour. Let me cut to the chase: this dish is amazing! It doesn't sound that exciting, but the flavors compliment each other perfectly. Hubby took one bite and said, "Oh yeah, you're adding this to the dinner rotation!" I served it with our normal taquitos (although with this batch, I added in a can of rinsed black beans...good addition!) and some fruit. 1. Preheat broiler to high. Cut each tomato in half and lay them skin side up on a baking sheet. Roast under the broiler until blackened (mine took about 10 minutes). Peel and cool slightly. 3. Heat 1 tablespoon of olive oil in a medium (2 - 3 quart) saucepan over medium-high heat. Add the puree and stir for five minutes, until seared and thickened. 4. Add the chicken thighs to the sauce (I flipped them over once so both sides could get a coating of sauce), cover, and cook over medium-low heat for 25 minutes until the meat is tender. Cool slightly and then pull the meat from the bones, shredding it. 5. Heat 1 tablespoon of olive oil in a large skillet over medium-high heat. Add the onion and potatoes and cook for 15 minutes until well-browned, stirring occasionally and scraping up brown bits. 6. Add the sauce and oregano, and then the chicken. 7. Transfer to a serving dish and then sprinkle with avocado pieces and cheese. We could easily see using this as a taco filling or maybe eating it for breakfast along with eggs. The recipe may sound a little complicated, but it's actually pretty easy to throw together, and it is so worth it! I'm excited to try more recipes from this cookbook.